We would like to introduce you to our brand new aluminium uncorded track. We have taken some time to redesign an existing product, making it easier to use without compromising quality and always keeping the curtain fitter in mind. 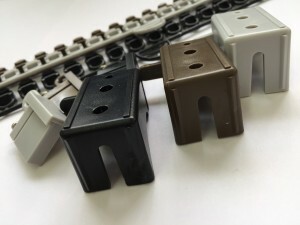 It is now available in four fashionable colours, black, white, bronze and silver, so the track can fit with any décor, we have also designed brand new fittings available in all four colours, which can now be colour matched with the track itself. The track is made from aluminium, which means it is a stronger track than most plastic ones, and with its strong nylon fittings it is ideal for heavy weight curtains. The track may be metal, but its extremely slim line with just a 1mm wall, making it more versatile. It now comes in up to 350cm lengths in one piece, which means you are less likely to have to join two tracks together making it easier to complete projects of longer lengths. 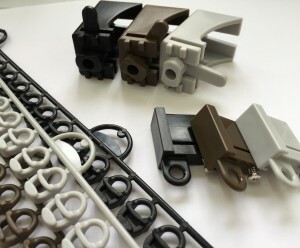 Retail packs and contract lengths are still available across all colours, so you are now able to mix and match each component and make the track your own. As well as redesigning aspects of the track we have kept the fundamental elements the same, as we want to continue to give the same quality product as we always have. 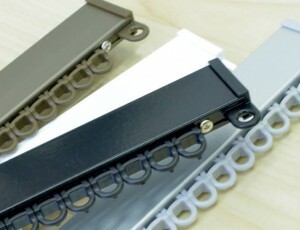 The track is still able to be fixed to both ceiling and wall, to give the you more flexibility, the wall brackets have be redesigned with a slot rather than a hole, making the process of fixing the track much easier as you can now easily fix the track in place, and modify the position of the track, after fixing, should you need to. The brackets are our easy fit brackets, these remain a key part as it does what it said on the tin, they are easy to fit, with their lever locking process and strong hold, they are the best bracket for this track. This track remains a staple product for us here at Jones and we are confident that it can bring the best of both style and functionality together, as well as being competitively priced and of great quality. We have only improved on this, always keeping the customer and consumer in mind.